Vanadium is all the rage for ASX junior Hardey Resources (ASX:HDY). Following the news extensively covered by Next Small Cap with regard to the company’s pending acquisition of Nelly Vanadium Pty Ltd (NVPL), owners of the Nelly Vanadium Mine in San Luis Province in Argentina, HDY has today come out with another potentially market moving announcement. Today’s news sees HDY bring its ambitions home, with strategic acquisition of six highly-prospective vanadium projects in Queensland and the Northern Territory. Four of the prospects can be found in Queensland near to the $39 million capped Intermin Resources’ (ASX:IRC) Richmond project (Inferred mineral Resource 2,579Mt at 0.32% Vanadium oxide (V2O5), cut-off grade of 0.29% V2O5. 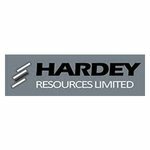 Given its Resource numbers, the Richmond Project is of global significance and HDY will be hoping to emulate Interim’s success thus far. Over in the Northern Territory, the proposed acquisition of two further projects will see it gain ground that is contiguous to TNG Ltd’s (TNG) Mt Peake project. The Mt Peake Project has a total mineral resource of 160Mt at 0.28% V2O5 cut-off grade of 0.10% V2O5. It also has a binding mine-life off-take and technology transfer agreement with Korea’s Woojin Metals. As you can see, there is a great deal of activity in these Australian regions and HDY will look to capitalise on the excellent conditions here to complement activities in Argentina. Although it is early stages in the life of these acquisitions and investors should seek professional financial advice if considering this stock for their portfolio. Vanadium will, indeed, become HDY’s primary focus as it moves strategically to evolve into an emerging vanadium supplier to the renewable energy sector. If and when all of its pending acquisitions come to fruition, HDY will be a geographically diversified company with a scalable global platform intended to meet the growing demand for vanadium, in the key China market. 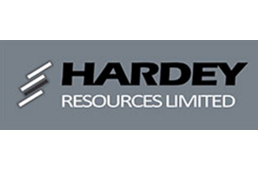 It is now the third week in a row that we have covered Hardey Resources (ASX:HDY) as the company continues to keep the newsflow coming, while it positions itself as a vanadium explorer with geographical relevance to global markets, most notably China. In last week’s catch up — HDY Fast Tracks High Grade Vanadium Mine Acquisition — we dove into how HDY had fast-tracked its due diligence for the acquisition of the Nelly Vanadium mine. This is a high-grade project, with a solid financial case, a straight forward regulatory process to reactivate a legacy mining licence and the ability to be reopened quickly. This Argentinean asset would also give HDY the opportunity to monetise legacy stockpiles as a direct shipping ore (DSO) vanadium product. Last week’s update followed the introductory article to the Nelly acquisition: HDY to Acquire Established Vanadium Mine. 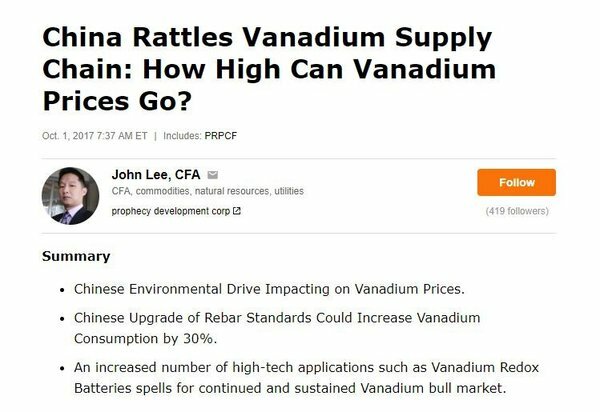 Those articles will provide you the full picture of why HDY has moved into the vanadium space, including how vanadium is one of the go-to commodities on the market. In this article, we take a look at how HDY is expanding its vanadium ambitions into Australia. Much like it did with Nelly, HDY has entered a share agreement with Australian-based Vanadium Mining and has been granted a 40-day option to acquire 100% of the issued capital of Vanadium Mining — a mineral explorer that owns six highly-prospective vanadium projects in Queensland and the Northern Territory. Vanadium Mining was established with the principal objective of acquiring vanadium projects in Queensland and the Northern Territories, a mission statement that now fits with HDY’s overall vanadium ambitions. During the 40-day option time, HDY will do its due diligence into Vanadium Mining and the six projects in Queensland and Northern Territory that become part of the acquisition. For full details of the financials see today’s announcement. Now let’s have a look at the projects in question. 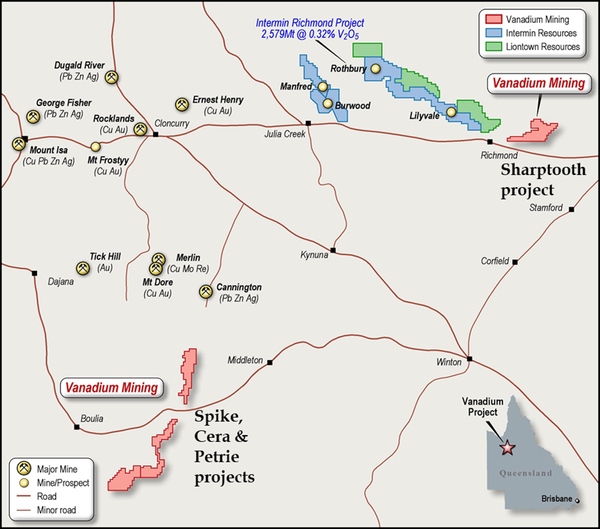 The four prospects in west Queensland — Sharptooth, Spike, Cera and Petrie — are located in an area that favours shallow surface mining for large tonnages of low-grade vanadium mineralisation. Here’s a look at the spread of these projects. These projects are highly prospective and lie in close proximity to Intermin Resources’ globally significant Richmond project (Inferred mineral Resource — 2,579Mt at 0.32% V2O5 cut-off grade of 0.29% V2O5), as well as the $32 million capped Liontown Resources’ (LTR) ground. LTR’s tenure has historic resources, but they do not comply with the JORC (2012) code, which could give HDY an advantage here. The $6.8 million-capped HDY will certainly be looking to this acquisition to increase its market value, especially as the projects are located within the Mt Isa region, most notably the Toolebuc Formation which is being increasingly recognised for its elevated vanadium potential. The area is also known for the prevalence of oil shale. This is important because oil shales usually have occurrences of vanadium and uranium mineralisation. Typically, this mineralisation combination is found within the Toolebuc Formation which is consistent with the underlying geology apparent for IRC and LTR’s known respective current/historic Resources. 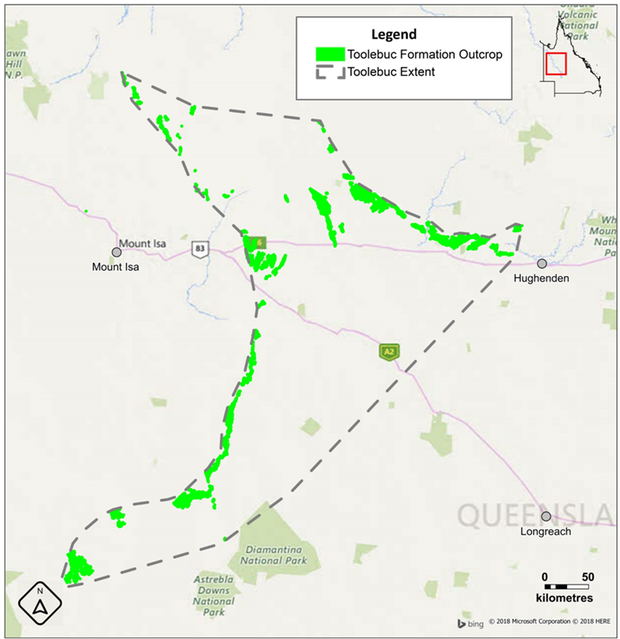 The four QLD projects show clear historical evidence of elevated vanadium levels within Toolebuc Formation and numerous historic reports and research confirm, that Vanadium Mining’s projects are generally highly prospective for vanadium mineralisation. Based on this legacy work, HDY has identified primary and secondary targets that align with the Toolebuc Formation outcropping. These targets have already been selected for follow up fieldwork. Whilst Queensland is considered highly prospective, the proposed acquisition of vanadium Mining’s Northern Territory projects also provide exceptional upside. 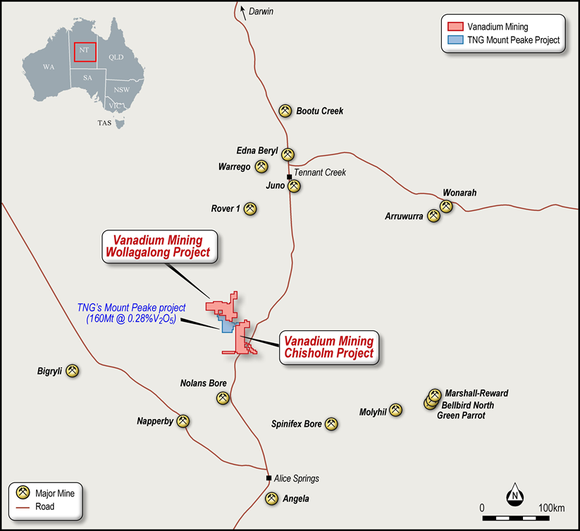 The two Northern Territory projects are Wollagalong and Chisholm, which are contiguous to TNG’s Mt Peake project the most advanced in the region), which has a Total Resource at 160Mt at 0.28% V205, cut-off grade of 0.29% V205. TNG has completed a Definitive Feasibility Study and already has a binding mine-life off-take and technology transfer agreement with Korea’s Woojin Metals. The China connection is important here is it is this market that will be a key focus for HDY when operations come online. Here are the Wollagalong and Chisholm Projects mapped out. Both Wollagalong and Chisholm exist in a region recognised for higher-grade mineralisation associated with ore bodies with the potential to be selectively mined by open pit methods. The land to be acquired by HDY identifies two phases of potential mineralisation, and has similar geological and magnetic features to TNG’s declared Resource for vanadium, titanium and iron. The similarities with the Mt Peake deposit, provides HDY with clear primary and secondary target areas for follow up fieldwork to assess the potential for vanadium mineralisation. Whilst HDY has taken its first tentative steps in Australia, it is full steam ahead in Argentina. Just yesterday the company reiterated the comparative advantages of reopening the Nelly Vanadium Mine (NVM) in Argentina, including the regulatory and operational benefits of restarting a past producing mine with established infrastructure. Essentially this means it can fast track the commencement of mining operations and cash flow. It is also establishing a mining platform, which can take up to five years, necessitating essential upfront capital expenditure. The good news for HDY is that under Argentina’s current laws, the process to reactivate a mining licence is relatively straight forward... and fast. HDY will soon meet with the directors of San Luis’ mining and environmental departments, so they can meet key decision makers and fast-track reactivating the licence. Although the company still has a lot of work to do, so investors should seek professional financial advice if considering this stock for their portfolio. Speaking of low costs and fast tracks, HDY is aiming to replicate the low production costs of the $896 million-capped Largo Resources’ (TSX:LGO) Maracás Menchen Mine in Brazil. Largo is the second lowest cost vanadium producer on a global basis, and the compelling investment attraction of delivering low all in sustaining costs is evidenced in the company’s share price performance over the past 12 months. 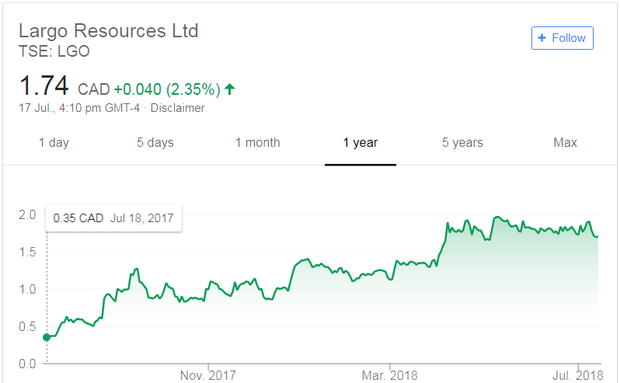 In that time the company’s share price has increased by close to 500% — from C$0.34 to circa C$2.00, and has been trading in a tight range between C$1.70 and C$1.90 over the past three months, as can be seen below. With the global demand-supply vanadium imbalance potentially in deficit, HDY is in a position to fast-track a new, low-cost, vanadium supply chain that is could be attractive to prospective off-take partners. As stated above, key near- to medium-term potential share price catalysts are the receipt of regulatory approvals and the establishment of a JORC (2012) Resource. 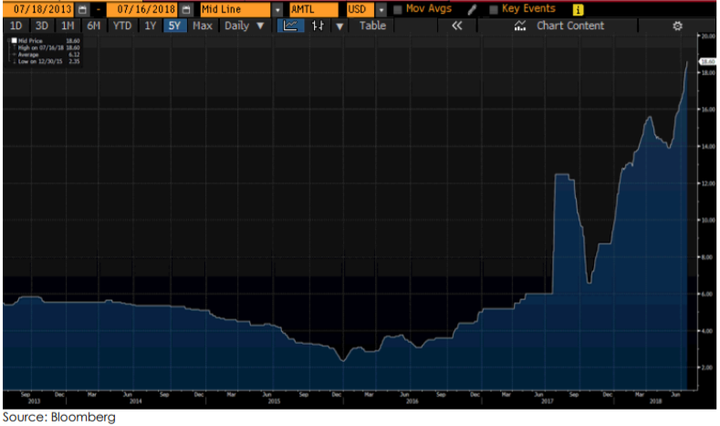 From a macro perspective, continued strength in the vanadium price could well rub off on Hardey. Of course commodity prices do fluctuate and caution should be applied to any investment decision here. Seek professional financial advice before choosing to invest in this stock. Securing early-stage off-take partners will aid securing project finance to accelerate mining operations recommencing. 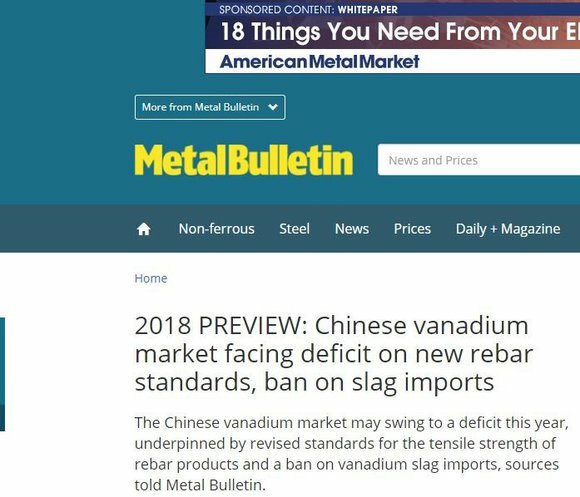 The article directly above, looks at the needs of the construction industry and the important role vanadium will play in this. It is any wonder, HDY is targeting China for offtake partners? HDY has not only fast tracked its Argentinean vanadium project, it is fast tracking its vanadium ambitions in their entirety. Whilst its NVM mine in Argentina is well on its way in the due diligence stakes, it is now making a vanadium stand closer to home, with not one or even two projects, but six potential acquisitions. HDY isn’t wasting any time in striking while the vanadium iron is hot and if it can complete the proposed acquisitions, it could give itself a an excellent chance of improving on its current, potentially undervalued $6.8 million market cap.